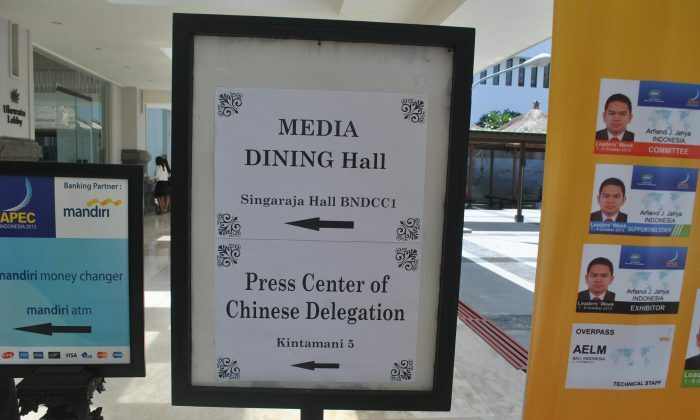 NUSA DUA, Indonesia—A local Epoch Times reporter was held for several hours while being questioned by security guards at the Asia-Pacific Economic Cooperation recently, preventing him from attending speeches given by the Chinese delegation. The reporter, Wayan Manuh, was accredited with an APEC press badge and had previously been able to move freely in and out of the conference grounds. On Oct. 8, however, he was pulled aside by security guards and prevented from entering either the media dining hall or the press conference held by the Chinese delegation, which were accessible via the same gates. When Manuh was entering part of the Bali Nusa Dua Convention Center, where APEC is being held, on Oct. 8, his card failed to work and he was taken down to the basement by security. “There were five to six officers there. I was treated like a prisoner. They asked why I was at APEC, how I got my identification card, and so on,” Manu said. Falun Gong is a Chinese spiritual practice persecuted in China by the Chinese Communist Party. Epoch Times reports regularly on the campaign against the practice, and has for years been designated as a target by the People’s Republic of China. Instances of harassment and disruption of the newspaper’s business, believed to be caused by PRC agents, include newspapers being stolen, offices broken into, property being stolen, and in one case the violent beating of a key technical staff member in his home. In 2000 in China, over a dozen Epoch Times staff were arrested in China; several served long prison terms. In 2007 in Indonesia, PRC consular officials demanded in a letter and visits to several Indonesian government departments an independent radio station called Radio Erabaru be closed. The station regularly covered the persecution of Falun Gong and other human rights abuses in China, and its signal reached the large Chinese diaspora in Indonesia and Singapore. Over several years Indonesian authorities attempted repeatedly to shut down the station, including raids in which equipment was confiscated. Their actions were condemned by Indonesian and international human rights and press freedom organizations. After an hour of questioning at the second location, where the chief of police of Bali was present, Manuh was allowed to leave. However, a plainclothes police officer then continued to follow him around and observe him carry out his journalistic duties. “When I returned to the hotel there were five more officers there, I suspect from the Indonesian intelligence bureau,” Manuh said. He had been held up for five hours in total. The Chinese delegation departed at between 2 p.m. and 3 p.m.